A Yale-led research group has created the most detailed maps yet of a vast seedbed of stars similar to Earth’s Sun. The maps provide unprecedented detail of the structure of the Orion A molecular cloud, the closest star-forming region of high-mass stars. 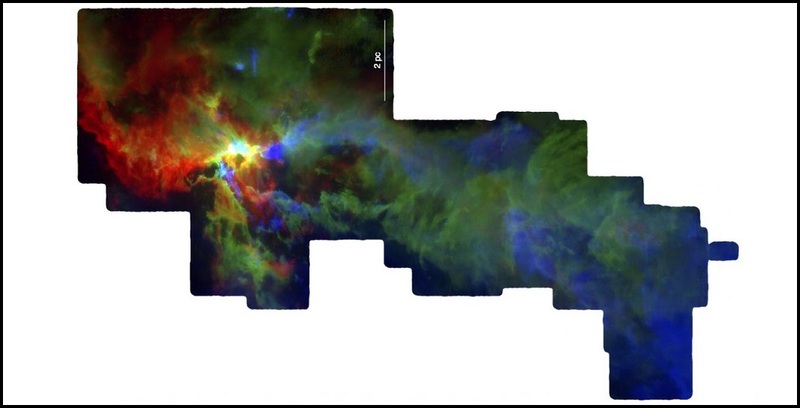 Orion A hosts a variety of star-forming environments, including dense star clusters similar to the one where Earth’s Sun is believed to have formed. “Our maps probe a wide range of physical scales needed to study how stars form in molecular clouds, and how young stars impact their parent cloud,” said Yale postdoctoral associate Shuo Kong, first author of a study about the group’s research that has been accepted by the Astrophysical Journal Supplements. The research team includes astronomers from institutions in the U.S., Chile, Japan, France, Germany, Spain, and the U.K. The team’s principal investigators are Yale astronomy professor Héctor G. Arce, ALMA Observatory scientist John Carpenter, and Caltech astronomy professor Anneila Sargent. In addition, the maps will help researchers calibrate star formation models for extragalactic studies. “The data we provide here will benefit research on a broad range of evolutionary stages of the star formation process and on the environment stars form,” Arce said. “The combined observations are a great help for astronomers seeking to understand how fast and efficiently stars form. For example, their maps show the energy released by high-mass stars has a strong impact on the cloud environment,” said Glen Langston, program director at the National Science Foundation. The research was supported by the National Science Foundation.